Hockey Ultimate Team(HUT) is the most popular game mode in NHL 17 and in the whole EA Sports’ NHL franchise. So, it’s likely you will try it out at some point, if you haven’t already. When you do, you will probably have a lot of questions… What are sets? What are collectibles? What do synergies do? Why is Matt Cooke a 92 OVR? All valid questions. Those and more will be answered below. Before we go in-depth with each aspect of HUT, I’ll just give a quick overview of what exactly HUT is. As the name suggests, it’s a mode bdesigned around the idea that you can build the ultimate hockey team. 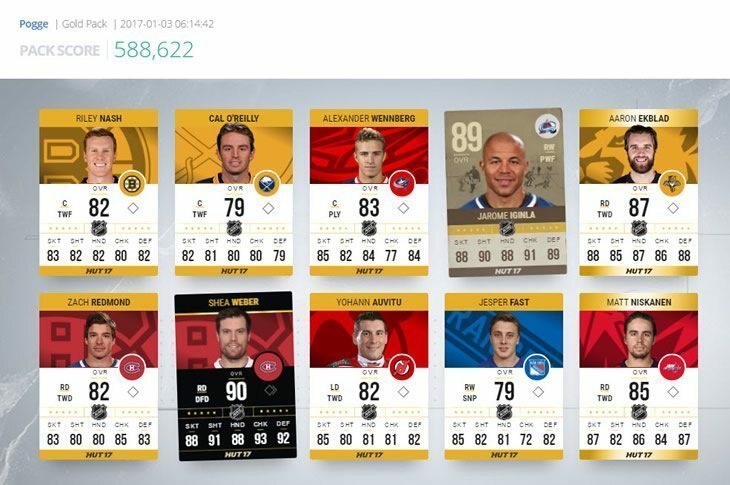 To do this, you use hockey player cards obtained through packs or the HUT Marketplace. When you own a player’s card you can put them in your lineup and play online or offline games with them to earn more coins(in-game currency) and progress through the Divisions all the way up to Division 1 where you will usually find the top competition. When you fire up HUT for the first time you will be given a “Starter Pack”. The items that come out of it are skewed slightly towards whichever team you have set as your “Favourite Team” in NHL 17. You will get their Jersey, logo, Arena, and at least a couple players from that team. So make sure you select a “Favourite Team” that you wouldn’t mind some players from along with their team information items. With that said, it is very easy to get new jerseys, logos, and arenas if you ever want to change those up. The most overwhelming aspect of HUT, if you’ve never played it before, will likely be all the different types of cards/items and different versions of those types. We’ll cover each type here and then go into the different player collections afterwards. Quick Sell: Card is simply exchanged for a minimal amount of coins immediately. Quick sell amount will vary depending on the rarity/collection of the card. Auction Item: Often you can get more coins by auctioning the player in the Auction House. We’ll go into more detail on this in the Marketplace section. Most of the player info is self explanatory; however, I do want to cover the info along the bottom as it can be relevant. The Team Information item type consists of Jersey and Logo cards. 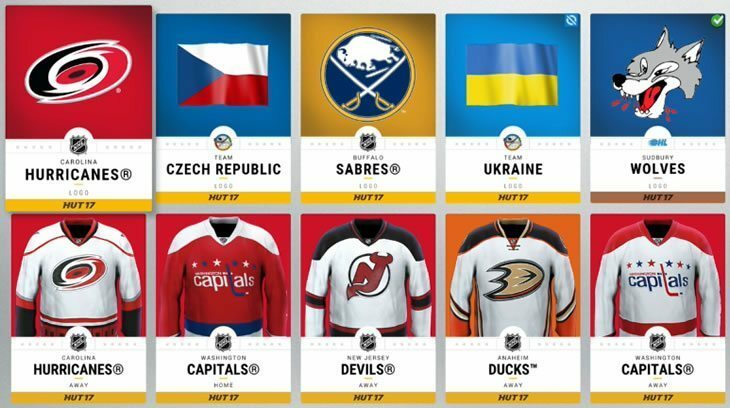 Your HUT team can have one active logo and two active jersey’s(home and away). You can’t choose which one is home or away. The game automatically assigns it based on the jersey itself; so you can’t have two home jersey’s and troll your opponents at jersey selection.Assign a Jersey or Logo by selecting it in your collection. Every HUT team can have one head coach. The only benefit of a coach is that they come with up to a +3 Team Synergy bonus. So, when choosing your coach make sure you have a good look at what synergies you want to activate. If you don’t know what synergies are yet, don’t worry! We will cover it in the Synergy Glossary section. Players only have a certain number of games they can play before a contract needs to be applied. Contracts are “consumables”; that means once you use one it is gone and you will need to buy another or grab a Consumable Pack(recently added permanent pack) from the HUT store. Each one gives a different number of games depending on the type of player card you are applying it too. For the most part, you will only ever use Gold Contracts.You can add a maximum of 2 Gold contracts on a player then you must play some games with them before you can apply another. The games remaining transfers over to the next user that gets the card if you were to sell it off in the Auction House. When your players get injured during a game the only way to “heal” them is to apply a Healing card. Like contracts, these are also “consumables” so once you use one then it’s gone. As you can see in the screenshot above, the Healing cards specify the type of injury they apply to and how many days they will reduce the injury period by. Arenas don’t add any benefit to your team – purely aesthetic. You can activate one Arena card for your HUT team and that will be your team’s home rink. Collectibles are used to complete “Sets”, which we will cover in more detail later on. At first they may seem pointless but you will soon realize that a lot of valuable players are obtained through sets so it’s worth holding onto these! I’ll give a short overview of each type of collectible and what it is for. If you are still confused afterwards then don’t worry, It will all make sense once you read the Sets section. 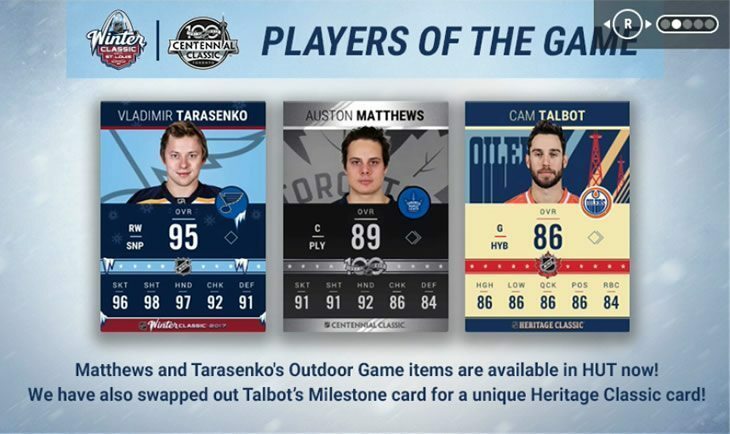 Basic collectibles are the most widely used throughout HUT. They are incorporated into almost all sets within the game. The Trading Post is the easiest way to earn Basic Collectibles, you can trade in a set amount of your coach, arena, logo, jersey, and player cards for Basic Collectibles. Obtained by completing Hero Sets. These cannot be traded and so far have no purpose but it is expected that EA will eventually release a special set that will require them. Obtained by winning games in Draft Champions mode. These are used exclusively for Draft Champions Sets. 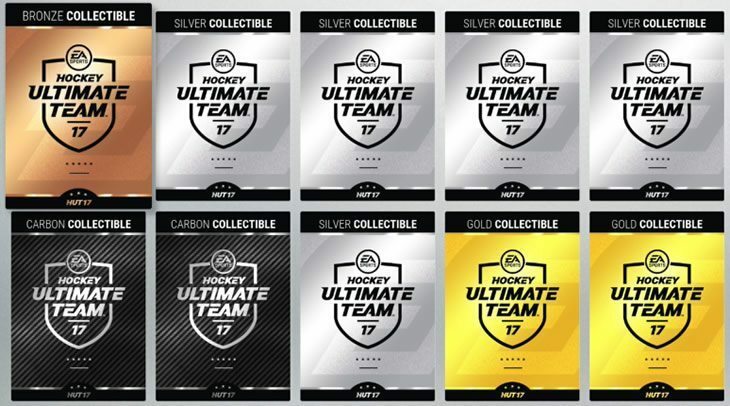 Every set, even limited time sets, have the option to trade one collectible for a random Gold Rare Player. EA adds that option to the Trading Post after the set has ended so you will always be able to use the collectibles for something, but their value will likely have dropped.More information on Limited Time Collectibles in the Sets section. Player collection type deserves it’s own section as you will find there are many different types of cards floating around and you are probably asking yourself what is the best? Is a card with flames all over it better than a Christmas themed card? Is a plaid card better than a black card? In short, it depends when the card was released as each new card a player gets will build upon the stats of the prior one so they constantly get better and better throughout the year. The one exception to that rule right now is Movember cards as they automatically upgrade based on the best card available for that player. I’ll explain each collection type below. *NHL rookies at the beginning of the season who don’t have Gold cards yet will often get upgraded early on in the season providing they are still playing in the NHL. 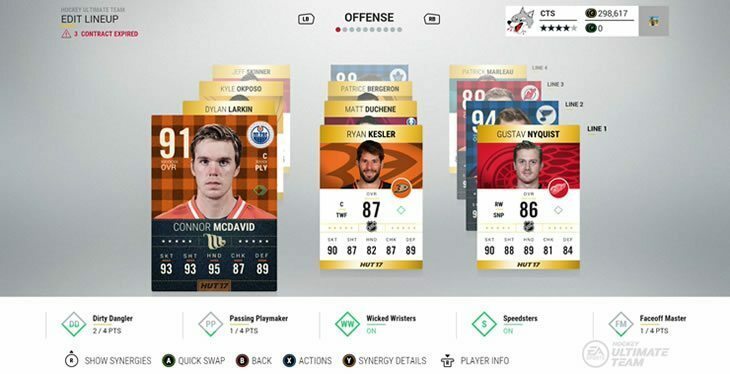 Players can earn Milestone cards several times throughout the year and same with all special cards they will build upon the stats of the last one so the player progressively gets better in HUT based on their real life performance. *Milestone cards are available for only 24 hours after release. If a player or goalie has an especially awesome performance then they may receive a Player of the Game card the following day. The player/goalie must also be on the winning team to be POTG eligible. POTG’s are added Monday-Friday. Any players that earn one on a Friday or Saturday will be added on Monday. *POTG’s are available in packs for only 24 hours after release.HUTDB also has a daily POTG Tracker to see who might be upgraded the following day. *International POTG’s are referred to as POTG in the collection menu but were also added as a Team of the Week. The team of the week consists of the best performing players from the previous Monday-Sunday period and are released every Wednesday. Every player with a HUT item is eligible; however, if a player received a special item in the week prior then they will be ineligible. This is in order to maintain the value of their previous special card.For example, if Claude Giroux earned himself a POTG card last week then he wouldn’t be eligible for the Team of the Week as it would mean getting two upgrades in a very short period and immediately devaluing his previous POTG card. Same goes vice versa, TOTW players are ineligible for POTG the following week. If you’re interested in knowing which NHL players might be on next weeks TOTW then check out HUTDB’s TOTW Tracker. This section will be updated once we have more confirmed information. For now you can check out my recent HUT Community TOTY post. 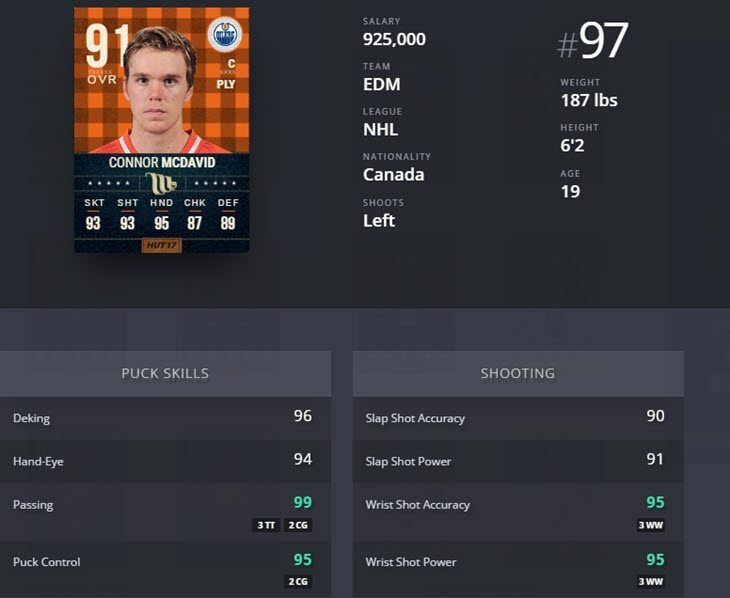 HUT Series 2 players are from the big HUT expansion that EA Sports added on February 2nd. Essentially every player that already had a Gold card in the game, got a new upgraded S2 card. Some were upgraded more than others based on their real life season performances to-date. This expansion also brought along 18 new synergies. 12 Player and 6 Team.I’ve updated the Synergy Glossary tables to include all the new synergies. Definitely recommend subscribing to DontbeSaad20’s YouTube channel as well, if you haven’t already! Any Gold players not on that list will have received just +1 upgrade on their S2 card. S2 upgrades do NOT have any affect on other cards besides Movembers as they will still match the highest card available, if that happens to be their S2 card then so be it. You will notice there are two new packs available in the HUT store, an Expansion 20 item pack and a 10 item pack. Exactly the same as the regular Gold packs but they contain only S2 players. When special TOTW, POTG, etc. items are released they will be available in both types of packs.Gold Packs and limited time packs such as the 35 item Ultra Pack can contain both S2 and S1 Gold Players. You will notice a limited time Series 2 Expansion Set is available until the end of February(2017). For more information on Sets check out the Sets section further down. Legends can only be pulled in packs and are available all year round. Legends range from 90-94 and all have multiple synergies. It’s worth mentioning that at this point most legends already have upgraded versions from limited time sets. HUT Heroes are obtained only from completing the Hero Sets. With that said, they are tradeable so you can purchase them from the Auction House. Draft Champion players are UNTRADEABLE and can be obtained exclusively from Draft Champions Sets. Unlike the above collections that are on-going throughout the year – EA Sports adds limited time collections in association with Limited Time Sets or special events. Once a limited time set ends, players from that set collection will no longer be found anywhere besides the Auction House, if they are tradeable. You may notice that Movember cards are especially expensive in the Auction House even if the card doesn’t have a great OVR. There is a good reason for that. 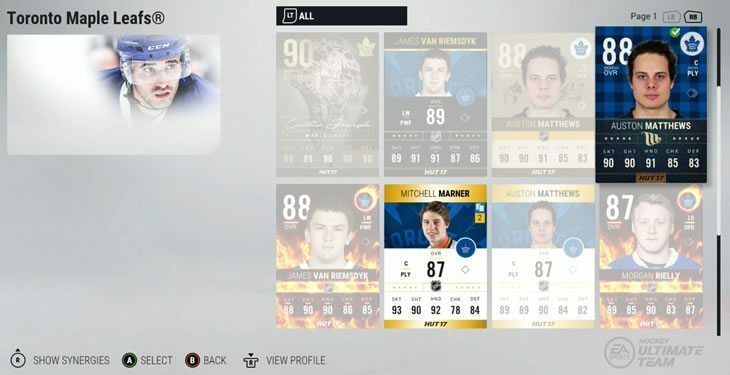 Movember cards automatically upgrade to that player’s best card! 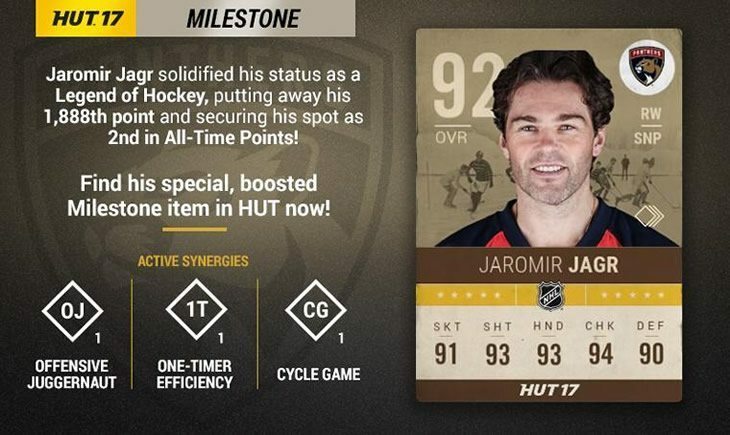 So when Jagr just received his big Milestone card that gave a +3 boost and bumped him up to a 92 Overall, it also bumped up his Movember card to 92 from 89! Awesome right? That means the value of Movember cards tends to increase and decrease based on real world performance. Keep that in mind when shopping in the Auction House. If a player gets injured, their Movember value will drop since they won’t have a chance at any upgrades until they are healthy – that could be a good time to buy. Why did Jagr get a +3 boost even though his overall was already over 85? That was a special case given how huge of a Milestone becoming 2nd all time in the NHL was. Any other 89 Overall player would of only been bumped up to 90. The above upgrade tiers don’t apply to Limited Time Set upgrades. Sometimes an active player will be included in a limited time set reward and their boosted overall can often be increased more than the tier limits above. The HUB is your main HUT dashboard. 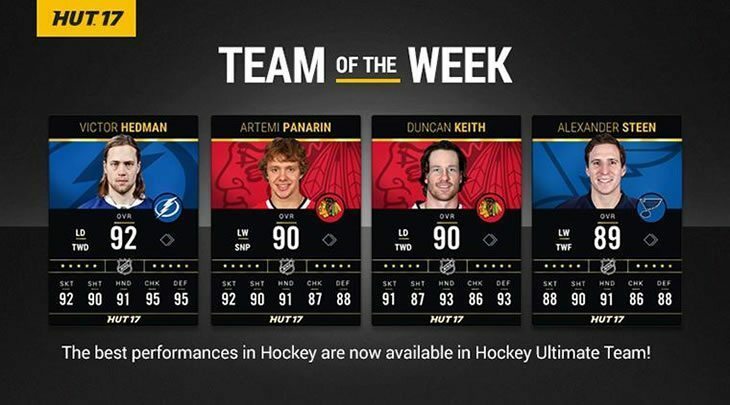 You will see the latest HUT news on the right – normally this will consist of whatever current special pack(s) is on sale, the Team of the Week, any other newly released card, and info about a new set if there is one. You can see right now in the screenshot below it’s showing the Gift of Giving Set. On the left side, you have four options, we’ll cover those below. This is where you can search through all of your Hockey Ultimate Team cards. You can either Press “Y”(Triangle) right away and search your entire collection or select a league and team to view what cards you have and don’t have in each team’s collection. Below is a screenshot after selecting a specific team. If you select a card here then you can “Search Auction House” to quickly view how much it is selling for and then you can either buy it or if you already own it then sell it. Collecting an entire team is not only a fun aspect(for some) of HUT, but it can also get you some really awesome rewards, which we’ll cover now. 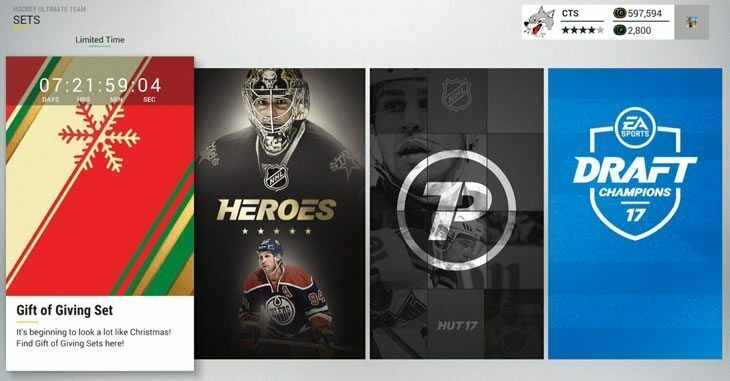 HUT has both permanent and limited time sets released throughout the year. Limited time sets provide an opportunity to collect and earn special cards that are only available during the duration of that set. ie. you can see the “Gift of Giving Set” in my below screenshot expires in just under 8 days. It will likely have expired by the time you read this and there will be no way for you to earn the special player cards from it, besides purchasing them in the Auction House. Heroes, anything in the Trading Post, and Draft Champions are permanent sets that can be completed at anytime and never expire. HUT Hero Sets require collecting a certain number of items that relate to a specific NHL team. 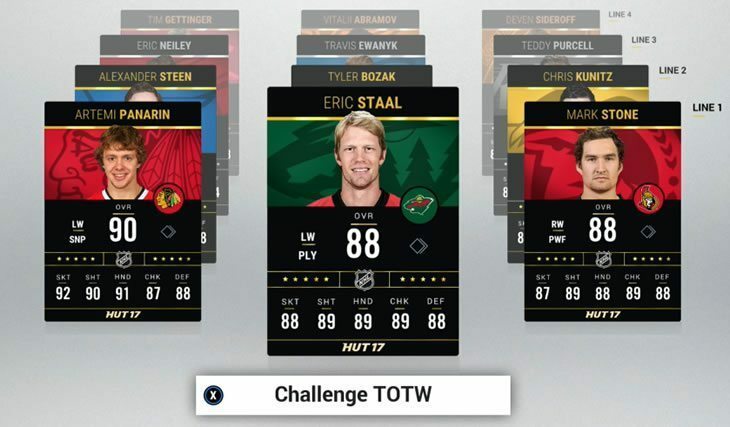 Each NHL team will reward you with a different HUT Hero once completed. The requirements consist of all 88 OVR and under players, jerseys(sometimes logos), team arena, and some Gold and/or Carbon Collectibles.The collectibles are usually the real kicker here since 88 OVR and under players aren’t super expensive but once you throw in 100K+ of Gold/Carbon Collectibles on top of that then it can get pricey, especially for someone just starting their HUT journey. There is only one team that doesn’t require any collectibles for their set, Boston. 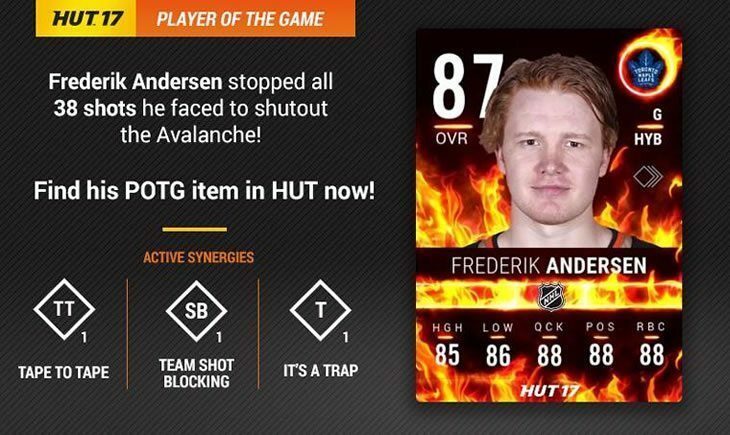 That would be a good option to start with if you’re wanting to get a HUT Hero straight out of the gate. Trade in your HUT items for Basic Collectibles, Upgrades, Coins, and Rare Gold Players. This is your HUB for gathering Basic Collectibles, which you will definitely need at some point if you plan on completing any HUT sets. Every limited time set has the option to trade a collectible in for one random Gold Rare player – EA Sports adds that option to the Trading Post after the set has expired, so leftover collectibles aren’t completely useless. If you’ve played Draft Champions at all then you will likely have some Draft Champion’s Collectibles laying around. You can trade them in here for HUT rewards. What about Ray Emery? I wouldn’t bother with the 88, but the 92 has arguably the best Synergy combo in the game. TW(2) and T(2) – no other goalie has +2 towards both of those synergies. 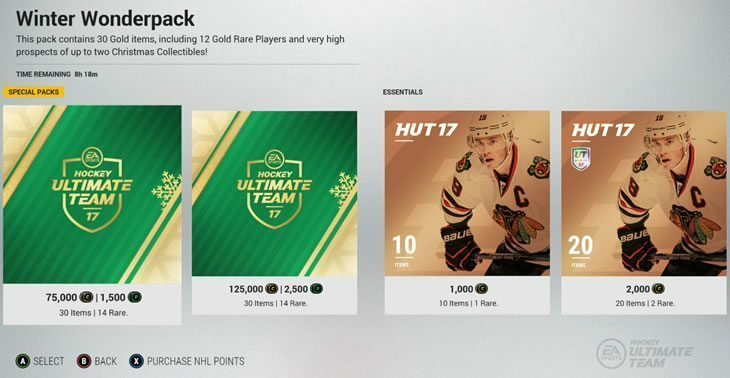 Limited Time Sets are new to NHL 17. For the most part they all consist of Novice, Epic, and Master subsets. The requirements to complete the sets will vary; however, they will always require limited time collectibles associated with that specific set. The limited time collectible can be found in special packs throughout the sets duration and/or obtained from Division Title and Playoff Champions Packs as they can contain any currently active HUT item. For an example of a limited time set, check out our Gift of Giving Set Guide. I’ll do a new guide for future limited time sets. Subscribe by email or follow on Twitter to be notified. Anytime you remove a card from your collection, ie. put an item up in the Auction House – if no one successfully bids on it then it will end up in your Item Inbox when the Auction expires. Same goes for if you successfully bid and win an item from the Auction House – it will be placed in your item inbox. When an Item is in your Inbox you can select it and send it to your collection, quick sell it, or Auction it. Synergies are new to HUT in NHL 17 and add a more strategic element to the way you build your team. When you combine certain players you can activate their synergies. There are two types of synergies. Player and Team, I’ve created tables below so you can sort by attribute. When activated, a player synergy will only apply to the players that have that synergy style. Team synergies on the other hand, apply to the entire team! That’s right, every player in your lineup receives an attribute boost. These synergies require more points to activate. You can see a couple team synergies(TT and CG) are also being applied there. 3500+ words later we are finally at the section where we talk about actually playing virtual hockey! Woot woot. You have a few different mode options when it comes to playing games in HUT. HUT Competitive Seasons is a new game mode that was added along with the January 19th NHL 17 patch/tuner. The first competitive season officially starts on January 19th, 7PM EST. The above information was included in the Jan 19th Patch Notes. **I will update this section after the Competitive Season has officially started and more information is available. UPDATE: I decided to write a new post for it, HUT Competitive Seasons Guide. This is the HUT bread and butter mode right here. When someone says they are playing HUT, it usually refers to Online Seasons. It is essentially Online Versus but with all the elements of HUT and using the team you’ve built. Unlike Online Versus, in HUT you have a Division system – You start out in Division 10 and work your way up to Division 1 earning coins and trophies along the way.Each season consists of 10 games and the requirements for advancing to the next division get progressively higher as you get into higher divisions. Every Division has a “Division Title” that will earn you some bonus coins and a Division Title Pack. You can see in the bottom left corner of the above screenshot that there are also playoffs in HUT. Playoffs start near the end of each month and last for 5 days. During that period you can choose to do a playoff game; which is separate from your regular season games and won’t affect your Seasons progress. The world table below illustrates the divisions and which cup each one qualifies you for. You will only have access to the cups that you have qualified for. It is inclusive, so if you’ve qualified for the Pro Cup you can choose to do the Rookie or Amateur Playoffs instead but you won’t have access to the Elite Cup run. In order to win the playoffs you need to win 4 consecutive games – you have two tries to do this. If you lose twice before winning 4 in a row then you will have to wait until next month to make another playoff run.Now that EA Sports has introduced Playoff Title Packs, the Playoffs are a lot more intense! There are awesome rewards to be had. The offline equivalent to “Online Seasons”. Work your way through divisions starting at 14 and progressing towards 1. Besides the fact you’re playing AI, you also now have a Schedule so you can see what teams you will play in the 10 season games. You will primarily play minor league teams at the beginning then more and more NHL teams as you progress. The in-game difficulty level will increase as well. This takes you to the regular Draft Champions game mode that is also shown on the NHL 17 home menu. You won’t use your HUT team in Draft Champions; however, it is the only place you can earn Draft Champion collectibles, which are used to complete Draft Champion Sets. Draft Champions is a fun mode to play if you want a game that is semi-competitive but doesn’t count towards any record or ranking. Although, I do wish EA Sports had a dedicated Draft Champions leaderboard to encourage more than just HUT players to try it out, it could be a really awesome mode – hopefully future NHL iterations will build upon it. Play Solo is if you want to play an unranked(non-season) game with your HUT team against the AI. You can choose to play against any official team in the game – NHL, ECHL, AHL, QMJHL, etc. Refer back to the Team of the Week Collection section for what exactly this is. You have the option to challenge the Team of the Week, this is a non-season game versus the AI, but you will earn some coins. Leaderboards, Recent Games, World Table, and your Trophy Case will be found in Stats Central. The ranking system in HUT favours games played more than it does wins vs losses. It is different than Online Versus. So it’s not exactly the best indicator of skill; however, you can sort by a user’s wins or losses on the leaderboard if you like – those columns are near the far right of the table. Includes your last 25 games with the result, opponent team name, duration of the game, and date it was played. View Player’s Leaderboard: Similar to viewing your own leaderboard where you see the 100 players in your group, but with your opponents leaderboard and the 100 players around them. Use “View Player’s Leaderboard” to easily check your recent opponent’s wins and losses record. They will normally be around the middle of the group that it gives you. Find their gamertag or team name and then hover over them to see their overall record on the right or scroll to the far right of the table to see their Online Seasons record. Challenge: Challenge the player to another game – same as “Play a Friend”, non-season game. You will be able to view their team BEFORE officially sending the challenge. The World Table is a graph to illustrate the amount of teams in each Online Seasons Division. As you progress through Online Seasons and/or Single Player seasons you will have the opportunity to win Division/League/Playoff titles – you’ll receive trophies that you can view in your Trophy Case. Fun little feature but you likely won’t check this section very often, if at all. Manage your HUT team. Manage lineups, check player statistics, adjust audio/visual/controller settings, and save default coaching strategies. Manage your currently active lineup. You can setup all lines including your Power Play, 4 Man Power Play, Penalty Kill, 3 Man Penalty Kill, Shootout order, and who your extra attacker will be if your goalie is pulled. Substitute: Substitute the player with one that is currently out of your line – this can only be done on the Offense and Defense line screens all all active players will be on one of those two screens. Special teams, shootout, etc. all must use players from your base offense/defense lines. Remove from Lineup: You definitely won’t be using this option with Connor McDavid, but this is to simply remove a player from your lineup and open up that spot. Perhaps you want to clear a full line before you start adding new players in. Player Info: View the selected player’s attributes, health status, contract status, games played, synergies, and basic info. Overview of your team’s record, rating, team salary, and player statistics. Team salary doesn’t affect anything – it’s just there because it can be.You can change your team’s goal horn and commentator team name in the “Audio Settings”. Perhaps the coolest part of the “My Team” page is the player statistics – it keeps track of your active player’s stats so you can see who on your team is performing and who isn’t. You can see I’ve grown attached so some of my players and can’t bring myself to replace them. I don’t recommend keeping Olli Maatta on your team in Div 1 but he’s the last one left from my starter pack… With ya until the end Maatta!! **If EA Sports reads this – I’d love to see more stats here! Especially a “Time on Ice” stat for each player – see if their poor performance is due to lack of ice time. Change your active lineup, create a new lineup, and save your default coaching strategies. HUT allows you to have more than one lineup saved so you can easily try out and compare different lineups without having to constantly edit your line after each game. The lineups don’t have to be made up of the same players either – you could have two lineups with not a single player in common, providing you have enough player card items to do it.Your player stats will still be maintained; however, your stats section will only show players from your Active lineup. This is an awesome feature that I wish Online Versus had, the ability to save your default team strategy settings so you don’t need to do it before every game. The above is what I currently start every game with; however, what works best for you will really depend on your play style and you will want to make sure you actively counter your opponent’s play style as needed. Learn more about the strategies in our two part NHL 17 Coaching Strategies Guide. Setup your Audio, Visual, Controller, and On-Ice Trainer settings here. If you’ve played any other modes and messed around with the camera angles then you will likely already know what you want to set here. Time to become the Wolf on Wall Street. 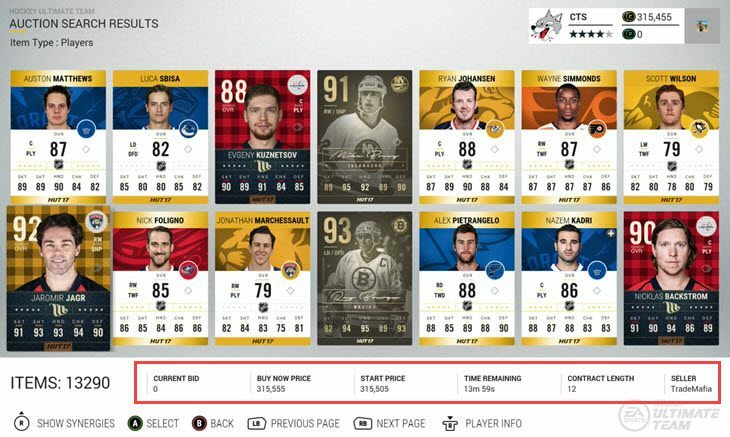 UPDATE: Check out one of our more recent posts for HUT Auction House Profiting Tips. Buy card/item packs with coins you earn throughout your HUT career or purchase some NHL points with real money and use those to get your hands on some packs. There will often be limited time packs available in the store as you can see in the above screenshot. It will show the time remaining for that pack below the packs description. Once a pack is expired then it’s gone until EA decides to add it back again, if they do. If you have an unopened pack that has since expired, don’t worry – you can still open it even after it’s no longer in the store.WARNING: Opening packs is addicting! Whenever you receive or buy packs and don’t open them right away they will sit in your Unopened Packs section. Browse the Auctions, check up on your bids and your watch list. You have several filters to help narrow down your search. Refer back to our Card Types and Player Collection Types section if there is any confusion there. I’m hovering over Jagr in the above screenshot. If you would like to bid, buy, or make a trade offer on the item then select it and a menu with those options will appear. When you are expecting a bidding war for the item then bid on it and head over to your “My Bids” section, it will be much easier to refresh the status and ensure you don’t miss the opportunity to outbid your opponent in the last 20 seconds. See video below for an example. Once you see it disappear from the “My Bids” section then you know someone has outbid you – go to the “unsuccessful bids” tab to bid again. In the above video, I accidentally clicked on “browse auctions” again, don’t do that! The above video illustrated the best use for this section; aside from just keeping track of what items you’ve bid on. You can add a player to your watch list by selecting them while browsing the Auction House and choosing “add to watch list”. When you add a player to your watch list it will show up here and you will have the same info and actions available as if you were browsing the auctions. Post new items for sale, monitor active auctions, and manage finished auctions. This will just take you to your collection search. Once you find the player you want to put up for auction then select them and choose “Auction Item”. That tax applies only when an item is sold so don’t worry about being dinged 5% each time you re-auction an item that isn’t selling. Before putting an item for sale you will likely want to know what the item is currently selling at. The easiest way to check this is by going to your collection and finding the specific team that the player plays for then selecting the player – you will be able to “Search Auction House” for that player and see all current listings to get an idea of what their average price is. I’ve illustrated this in the video below. At that time, Kesler’s price was commonly between 3000-5000. I’ve put him up in that range, I did 6 hours as it’s currently middle of the night so wanting to make sure more people are online when it’s near expiry. Nothing special here. List of your active auctions and you can view trade offers if you have any. You will find your unsold and sold expired auctions in “Ended Auctions”. Unsold items you can throw back in the Auction House from here or send back to your collection if you’ve decided not to sell it anymore. Congrats! You now know all the HUT basics! Want to learn more and discuss Hockey Ultimate Team with others? I highly recommend joining the friendly reddit.com/r/NHLHUT community. I frequent it myself and find it to be the most active and well moderated HUT community out there. As seen in the Desktop right sidebar screenshot above you can also share your Gamertag/PSN if you wish, via “flair”. Don’t be afraid to say hi, enjoy! Another community forum worth keeping up with is EA Sports’ NHL HUT forums. You will find occasional announcements there. 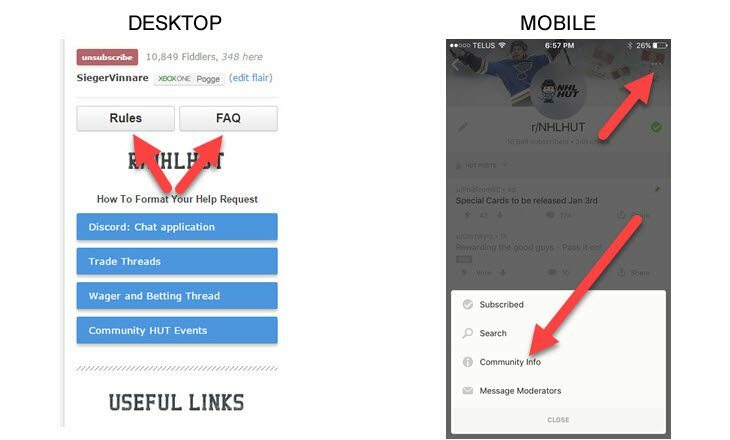 You’ve likely noticed that I’ve referenced HUTDB a number of times throughout this guide, I wanted to give it a special mention at the end too because it is a massively helpful NHL 17 HUT resource. The guys over there have put a ton of work into the site and are still improving it even further, Follow HUTDB on Twitter for new feature announcements. I suggest signing up and adding your HUT team there so it’s saved for whenever you want to try out different synergy combinations. They have a new “Copy Roster” feature so you can easily make substitutions and compare to your currently active team, much faster than in-game, even if you did already own all the players. Here is my currently active HUT team for those interested: ChelTips HUT TeamIf you’re a free to play HUT player and feel like you’re missing out on all the fun of opening packs then you can take advantage of their Pack Opener too. It provides no benefit to your actual HUT team, but just a fun little mini game that tracks your on-site collection progress and the value score of each pack you open. At first, I was like who the hell would waste their time opening fake packs? Then I ripped about 50… maybe even 100, I dunno it’s all a blur now. I do plan to keep this guide updated as new sets in 17 are released and all the way through NHL 18 onwards. Find a mistake or something missing in the guide? Let me know in the comments and I’ll fix it up. Are you still reading? I know what you’re thinking… Hey you never explained why Matt Cooke is a 92 OVR!?! I’m not going to lie… I have no idea – it keeps me up at night. Maybe equivalent to the number of careers he’s ended? I dunno. If anyone knows please share your wisdom in the comments so all HUT players can finally get a good nights sleep. 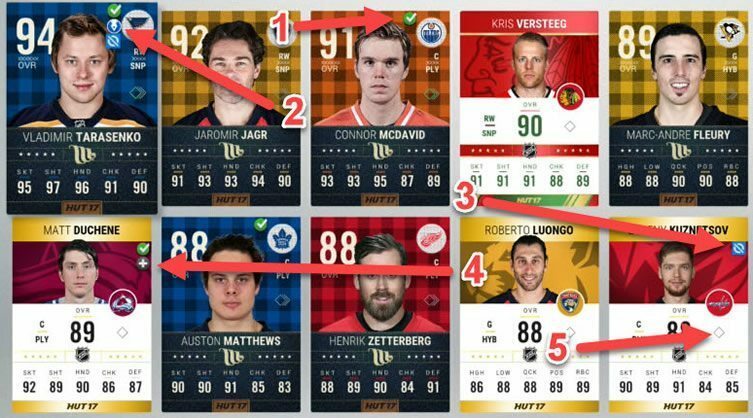 This is seriously the Ultimate HUT guide on the entire internet! Well done cheltips.com! The amount of work put into this I could only imagine.. Thank you for putting out great material. Impressive work. I have few friends who want to start playing HUT instead of Online Versus. Problem is that they feel HUT is too complex. I’ll definetly show them this. Also this piece reminds me the old times when games came out with proper manuals. Two questions though. Do you still assign your lines while using old Chemistry-settings. Like PLY-2WAY-SNP for example? And is it true that there is no penalty in using players in “wrong” positions? Like putting center on the leftwing? I remember that in old gen you had to buy position-change card or something like that. Awesome, hope it helps them out! They took out “Chemistry” and replaced it with Synergy, so player type shouldn’t matter. 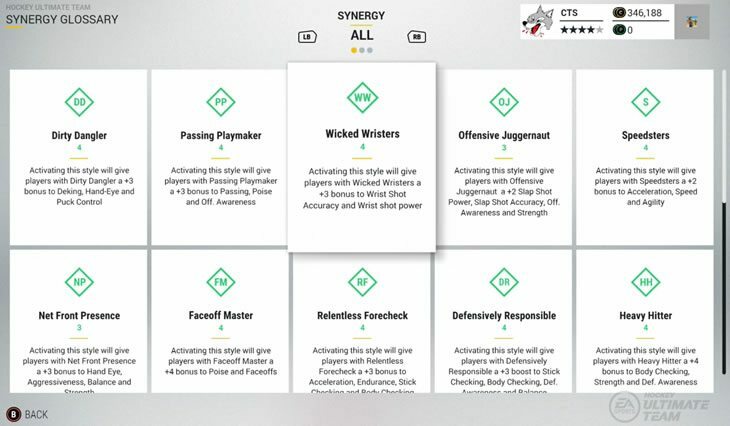 The nice thing about Synergy is that when EA releases special cards they usually give the player different synergies than their base or at least additional synergies allowing you to fit them into more lineups without sacrificing synergy. Far as I know that is true yes, there is no penalty for using players in wrong positions – at least no evident penalty anyway, not sure if EA is hiding something behind the scenes 😀 doesn’t seem like it though. If someone sees this and knows otherwise then please do correct me. Great write up, im serious. Hit everything. Two things; first, there is a contract limit and the game lets me put up to 2 gold contracts at once, although i havent tried adding bronzes or silvers. Two, HUTDB has a reddit account, it is /u/sreid. Thanks Matt! and also for the correction, I’ve fixed the Contracts section 🙂 As for the HUTDB reddit account I’ll just leave that in the comments as additional info. Two different “Matt” comments in a row, had some deja vu for a second there. No problem, I know you’re one of my earliest supporters, really appreciate that! Very nice guide indeed! A couple stupid questions. I played HUT quite intensively all the way back in 13 or 14 and have been out of NHL series since. Have been enjoying 17 very much and looking to get back into HUT as well. Now, the questions: I remember having to fiddle with salary caps and long term contracts to lock in strong prospects (never got that Seguin, though) and boost them with consumables. Have all of these aspects been scrapped. Now it’s just about players and not so much about the cap and boosting consumables? I.e. No point having that AHL 4th line anymore? Also, I remember they players had a max career length. Has this been removed as well, i.e. will Jagr go on until I run out of contracts to slap on him? Thanks a lot for the guide and any answers already in advance. Hey Pallo, welcome back to the series! Now it’s just about players and not so much about the cap and boosting consumables? I.e. No point having that AHL 4th line anymore? I didn’t play HUT much in 13 or 14, but yes Salary Caps aren’t a thing anymore – it still shows what your team Salary is, but there is no cap so no need for any AHL players. The only two types of consumables are “Healing” and “Contracts”. Also, I remember they players had a max career length. Has this been removed as well, i.e. will Jagr go on until I run out of contracts to slap on him? Hope that helps, thanks for visiting the site. Great guide, I love it! One question though. In previous NHL’s there was some kind of bar that showed the rarity of the card (1/5, or 3,5/ 5 etc.) How do you know the rarity of the card in NHL17? Hi,anyone can help me how can i sell a player,if i click on him,i have only player info option,rarely quick sell,but no auction item. If the player is a starter on your team you cant sell him. Take the player out of the line-up first! Anyone know if you can stack CS reward packs? is it possible to move my draft champions players into my hut team? Unfortunately there is no way 🙁 you will need to save up coins and buy the players in HUT OR get lucky with HUT packs. Draft Champions is more useful for testing out some of those high end players before you buy them. I am new to HUT and although NHL 17 is coming to an end I am gearing up for NHL 18. Since I am new to collecting cards and building teams my biggest question is how to get the different types of players cards. Do you get them by purchasing special packs when they are offered or is there another way? For example I am wondering how to get player of the game, team of the year, movember, halloween players cards etc. Do you get these by purchasing regular gold pack cards and hoping you pull one or is there another way? Any information you can provide is greatly appreciated. Thanks for your help.